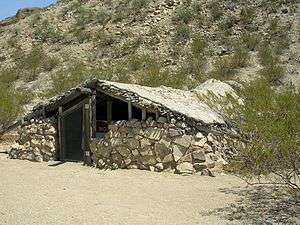 The jacal is an adobe-style housing structure historically found throughout parts of the southwestern United States and Mexico. This type of structure was employed by some Native people of the Americas prior to European colonization and was later employed by both Hispanic and Anglo settlers in Texas and elsewhere. 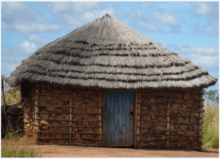 Jacal construction is similar to wattle and daub. However, the "wattle" portion of jacal structures consists mainly of vertical poles lashed together with cordage and sometimes supported by a pole framework, as in the pit-houses of the Basketmaker III period of the Ancestral Puebloan (aka Anasazi) Indians of the American Southwest. This is overlain with a layer of mud/adobe (the "daub"), sometimes applied over a middle layer of dry grasses or brush which functions as insulation.